[152 Pages Report] The application control market size is estimated to grow from USD 1.25 Billion in 2015 to USD 1.90 Billion by 2020, at a Compound Annual Growth Rate (CAGR) of 8.7% from 2015 to 2020. Application control is a security practice to restrict the unauthorized and unwanted applications from executing on endpoints to guard the organization’s endpoint environment. The report aims at estimating the market size and future growth potential of the application control market across different segments, such as components, access points, organization size, verticals, and regions. The base year considered for the study is 2014 and the forecast period is 2015 to 2020. The rise in the adoption of the Bring Your Own Device (BYOD) trend and the usage of mobile devices to access organizational data and applications are propelling the market to grow in the next five years. The application control ecosystem comprises security solution and service providers such as Symantec Corporation, Intel Security, Trend Micro, Check Point Software Technologies Ltd., CyberArk, Carbon Black, AppSense, Digital Guardian, and others; system integrators such as CSC and HP, and various consulting firms such as Accenture, Deloitte, and Ernst & Young who sell these application control solutions to end users to cater to their unique business requirements and security needs. MarketsandMarkets forecasts the application control market size to grow from USD 1.25 Billion in 2015 to USD 1.90 Billion by 2020, at a Compound Annual Growth Rate (CAGR) of 8.7% from 2015 to 2020. The major factors driving the growth of the market are the need to protect data against internal and external threats and the limitations of traditional security solutions to secure applications and data running on corporate endpoints. Furthermore, due to a rise in the demand for integrated security solutions, the market finds huge opportunity to proliferate in the next five years. The scope of this report covers the application control market by component, access point, organization size, vertical, and region. The application control solution market is expected to hold the largest market share and is projected to dominate the application control market from 2015 to 2020, due to the growing need for multi-layered and integrated security solutions. Application control services segment is expected to play a key role in changing the security landscape and grow at the highest growth rate during the forecast period, as these services assist organizations in implementing, integrating, and monitoring the application control environment through established industry-best practices. Application control for desktops/laptops access points would dominate the market and is expected to contribute the largest market share, whereas application control for mobiles/tablets access points would grow at the highest rate during the forecast period. Large enterprises in the application control market are expected to contribute the largest market share and would also grow at the highest rate during the forecast period. The application control solutions are being increasingly adopted in various verticals, such as government and defense; Banking, Financial Services, and Insurance (BFSI); and healthcare, which have led to the growth of the market across the globe. 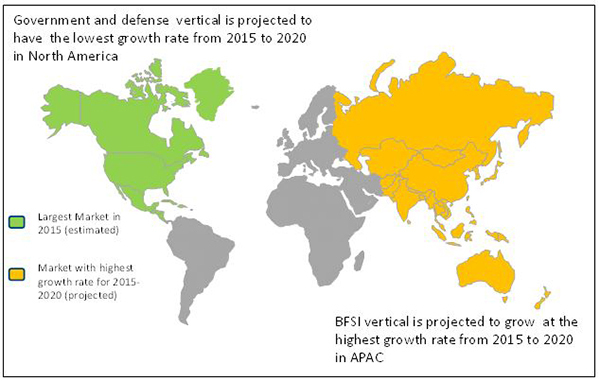 The BFSI vertical is expected to grow at the highest rate from 2015 to 2020, in the application control market. The market is also projected to witness growth in the healthcare, retail, and IT & telecom verticals during the forecast period. North America is expected to hold the largest market share and dominate the application control market from 2015 to 2020, due to the presence of a large number of security vendors. Asia-Pacific (APAC) offers potential growth opportunities, due to a rise in the Bring Your Own Device (BYOD) trend in small and medium enterprises and large enterprises, which has led to a rise in the usage of portable devices and safeguarding of those endpoints against potential targeted threats. The impact on end user experience and shadow IT risks are restraining the growth of the market. The major vendors in the application control market include Symantec Corporation, Intel Security (McAfee), Trend Micro Inc., CyberArk, Check Point Software Technologies Ltd., Carbon Black Inc., Digital Guardian, and AppSense, among others. These players adopted various key strategies such as new product developments, product innovations, mergers and acquisitions, partnerships, collaborations, and business expansion to cater to the needs of the market. 13.6 Check Point Software Technologies Ltd.